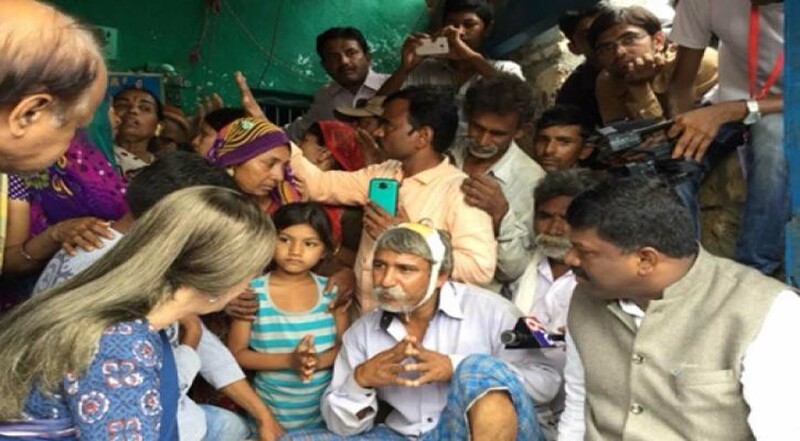 “DALIT atrocity is Gujarat model, that is why Modi is silent”, said CPI(M) Polit Bureau member Brinda Karat after visiting Samadhiyala Village in Junagadh, Gujarat. A CPI(M) delegation led by Brinda Karat with P K Biju MP, Arun Mehta, Central Committee member and many other state leaders met Sarviya Babu Bhai and Kavita Bai at their home, parents of the young men who were brutally beaten and humiliated by a vicious mob of gau rakshaks. They told the delegation that they were not at all satisfied with the investigation. Although at least 35 people were involved in the crime only 16 have been arrested. The promised five lakh rupee compensation has also not been given by the state government. The delegation has demanded immediate action and also ban on gau rakshak samities.